Gaining the appropriate level of knowledge to begin trading doesn’t have to cost a fortune. Fortunately for you and I, some of the best traders in the world love putting their best thoughts down on paper in their best trading books. For $5 – $30, we can leverage the wisdom of the world’s best traders. Lessons which took years to learn and in many cases, many blown up trading accounts. All successful traders have their favourite stock market books and trading books which formed the basis of their success and growth as a trader. These are known as the best trading books or even the classic trading books. You will find them in every traders’ arsenal complete with dog ears, highlighted sections and tabs referring to important sections of the book. Your bank account will always grow in direct proportion to the amount of personal development you take on board. We have split the best trading books into sections to make it easier to decide which books are best for you and your trading. Before we jump into the top 3 trading categories of books you must own, here are our top 8. Below is a list of our top 8 trading books. By our top 8, we are referring here to the all-time classic books. The best books have stood the test of time. You will find them on nearly every fund manager’s bookshelf. Any trader managing serious amounts of money or trading for others will have these on their bookshelf. When it comes to the all-time classic trading books, we like the ones that have a mixture of technique, structure, mindset and plenty of trading ideas. You see, many of us know how to trade. We have our own trading systems and implement in the market on a daily basis. But it is the trading ideas which can really push your trading to the next level. This is what our number 1 best trading book to recommend is the Market Wizards series by Jack Schwager. There is no better way to get hundreds of trade ideas except by interviewing the smartest traders of all-time. But don’t just think you are going to get a bunch of new trading ideas. You also need to consider how many ideas will help save you from ruin. Many of the world’s leading traders are brilliant at avoiding disaster, just as much as banking huge winning trades. So don’t put the blinkers on and focus on the best entry techniques or swing trading entry, but look for the subtle hints around handling losses. As a keen golfer, I know the importance of avoiding disaster around a golf course. The worst shot a golfer can hit is Out of Bounds. This is the worst shot as you have to play your shot back on the tee and you drop as shot. It is a full 2-shot penalty. Letting a stop loss run and hoping it will come back is the equivalent of the worst mistake you can make. You just never know how long a position will run against you. In particular, if you are trading short and the stock gets a takeover bid and jumps 30%, you have to take your medicine. Get out fast. When reading the best trading books, you will hear time and time again how the best traders wiped out accounts in their early years while waiting for a miraculous turn-around. They often don’t happen. Let’s take a look at the top 3 trading book categories. These categories represent the best value for your time. In regards to the best trading books, we have split our sections into 11 categories. But when starting out, you are best focusing your attention on what we call the top three trading book categories. Here you will find the best books to help you improve with your trading the most. Why the best technical analysis trading books? The reasons why this category comes in at number 1 is because the greatest number of traders focus on technical analysis. Even if you hate the idea of using technical analysis, you must understand how others use it to find an edge with your trading. Let me explain a little further. If 80% of traders are following a basic support line on the S&P500 or a specific stock like Facebook, if it breaks, there will likely be a strong run to the downside. As a fundamental trader, it pays to understand where the key technical levels are, even if you are not using them. When you combine both fundamentals and technicals, you will greatly improve your chances of success in the market. Why the best trading mindset books? 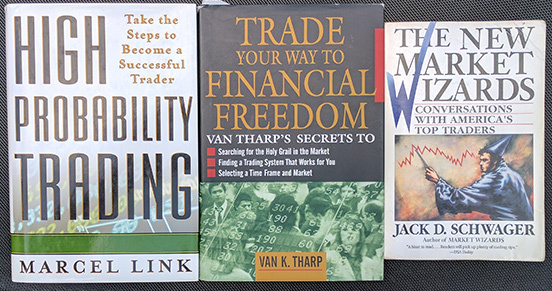 Van Tharp is known as one of the world’s top trading coaches. Many years ago, as he was working with traders, he made comments along the lines of mindset and psychology makes up 80% of a traders success. However, nowadays, Van Tharp has nudged that figure to 100%. A pretty significant jump don’t you think. The reason being is every decision you make is based on your thoughts and mindset around it. The system you created is based on everything you have taken in around the markets up to this point in time. Have you ever read a classic trading book for a second time years later? While reading it, did you ever get the feeling it was a completely different book? The reason the book feels like a new one is because you have changed as a trader. You have grown. You have made mistakes. You have closed out some of your best trades. But you have grown. You are a new trader. Your mindset has changed. This is one of the key reasons why mindset is so critical to your results. Why the best swing trading books? Most new traders begin their journey as a long-term buy and hold investor. Some years, the buy and hold approach works wonders. Other years, the volatility in the markets favours the short term trader. Swing trading is one of the best ways for longer term investors to make the transition into more active trading. The time frames are more active, but they do not involve buying and selling 5-100 times per day, as a good day trader might. So the transition for most traders is the best when moving to swing trading. Also, the number of books written about swing trading are by far the greatest. The beauty of reading the best swing trading books is the number of trading techniques they offer. You see, trading ideas are extremely valuable when you are starting out. You are always best learning from those people and techniques which have a proven track record. There are literally thousands of solid swing traders out there and many of them have written some of the best trading books available. So your goal isn’t necessarily to become a swing trader, but it is to learn all the techniques and ideas and apply those to your ideal timeframe. You must collect a few of the best swing trading books and study them. You will never run out of trading ideas if you do this. Before we get to our top 8 best trading books, here are the 11 trading categories we have divided our best books into. Just click on each link to find out more about the best books in the section. What is the best trading book available in 2018? It is hard to create a modern trading book a classic. So many of the best traders today have learnt their lessons from the classic trading books of our time. Very few of the most recent ones have new ideas. You will have to appreciate that our number 1 trading book for 2018 is an all-time classic, not one released in 2018. I know you will understand. Jack Schwager positioned himself early in his career as the leader in interviewing the best traders of our time. 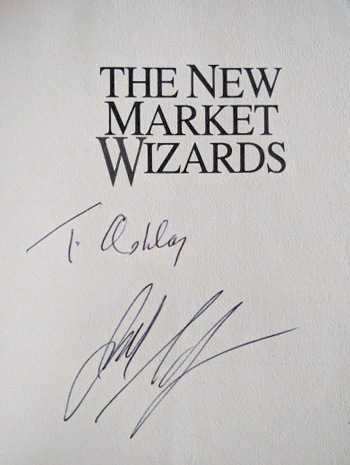 The New Market Wizards was released in 1992 and contained the very best interviews with the best traders of the 1980’s. When Jack toured Australia, I managed to get mine signed. Wasn’t going to let an opportunity like that pass by. Mindsets, trading ideas, technical strategies and the mistakes are all copied down to create this all-time classic book. There are a few more, but you get the idea. Many blew up a few accounts before they became successful. All of them learned the hard way and what it takes to be successful. They all discuss how trading is a 5-7 year apprenticeship before you truly appreciate the power and opportunities available when trading successfully. In addition to the interviews, Jack Schwager, a trader himself, distills the biggest lessons learned at the back of the book with 42 lessons. It is the 42 lessons that every trader must read several times a year. It is the perfect grounding platform to get back to basics and level up. 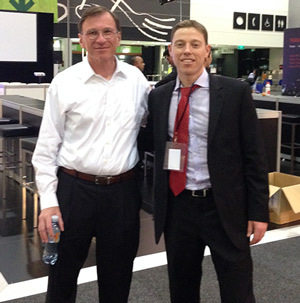 I even managed to get a photo with Jack Schwager. A true trading idol of mine. Share the post "Best Trading Books You Must Own in 2018 – All Time Classics"